This is one of three carved, oak panels (which make up the complete set of The Anne of Cleves’ Panels); it is carved with Anne’s initials ‘AC’ and is surmounted by a ducal coronet. I know you love a good Tudor mystery, particularly when that mystery involves the potential uncovering of a genuine ‘new’ Tudor artefact, one whose provenance was lost for nearly 500 years. This is the case with the Anne of Cleves Panels. In 2016, when Natalie Grueninger and I released our second ‘In the Footsteps’ book, In the Footsteps of the Six Wives of Henry VIII, I wrote about the incredible ‘discovery’ of a set of carved, oak panels (said to be related to Anne of Cleves) in a small parish church in Bedfordshire. At the time of writing the book, we had strong evidence that these panels were contemporary to Anne of Cleves’ lifetime, and had once adorned her personal domestic environment. And yet, we could not be absolutely sure. We were missing one last vital piece of evidence. This evidence was dendrochronology – the dating of the wood itself. At the time of publication we had not been able to take a sample from the panel. This final bit of evidence was crucial and would decide if the panels were fakes or precious national treasures. However, eventually circumstances allowed us to put the panels to that final test. For the first time, I am revealing the results of that test. Hold on tight while I take you on a rollercoaster of a ride! For those unfamiliar with the story, I will recap the unbelievable twists and turns before revealing the missing piece of the jigsaw. During the course of my research into the early life of Anne of Cleves for In the Footsteps of the Six Wives, I came across a chance mention of a set of carved, oak panels, currently in situ in St Leonard’s Church, Old Warden, Bedfordshire. Scanty references and the odd photo from previous amateur time travellers had been logged online, along with the tantalising reference that these panels had been salvaged from ‘Anne of Cleves’ chapel in Bruges’. Pevsner had dismissed the claim outright, stating in his book, Buildings of England: Bedfordshire, Huntingdon and Peterborough (p.131), ‘What has Anne of Cleves got to do with Bruges?’; I knew the answer to that question and was too intrigued to let the statement pass me by without further investigation. I had hoped that the panels, and the mythology surrounding them, would lead me to Anne of Cleves’ lodgings as she passed through the city of Bruges. To cut that long story short, it turned out to be a red herring. Ultimately, we would conclude the panels had nothing to do with Bruges. However, as it turned out, fact was more interesting than fiction! This is the quality of carved oak panelling which might have covered the walls of a royal gallery. The conclusion from our research was that this design would have been gilded, as can be seen panelling depicted in The Family of Henry VIII. I quickly made contact with a local historian, Christine Hill who had a particular interest in Old Warden and its nineteenth century squire, Lord Ongley. Through Christine, I learnt of how the eccentric English gentleman had apparently salvaged the carvings from the continent, and that the set of twenty-two panels of three separate designs (see images above; the carved initials, ‘AC’, surmounted by a ducal crown, the ‘spoked wheel, which we identified as being the heraldic emblem for the Duchy of Kleve and the lion’s head) had been examined over the last 130 or so years by various professional and amateur commentators alike. Over and above Pevsner’s outright dismissal, disparate conclusions had been drawn about their origins, with France, the Low Countries and England all being variously mentioned as the country of origin, whilst the dating of The Anne of Cleves Panels ranged from the sixteenth and eighteenth centuries to nineteenth century replicas. I couldn’t help but think of Churchill’s phrase; it seems we had a ‘riddle wrapped in an enigma’ on our hands. It was fast becoming clear to me that enthusiasm alone would not unlock the secrets of the carvings. We needed to bring to bear all the latest scientific and historical expertise if we were to have a hope of getting to the bottom of the mystery. Whilst pondering how to bring this about, we had a breakthrough. 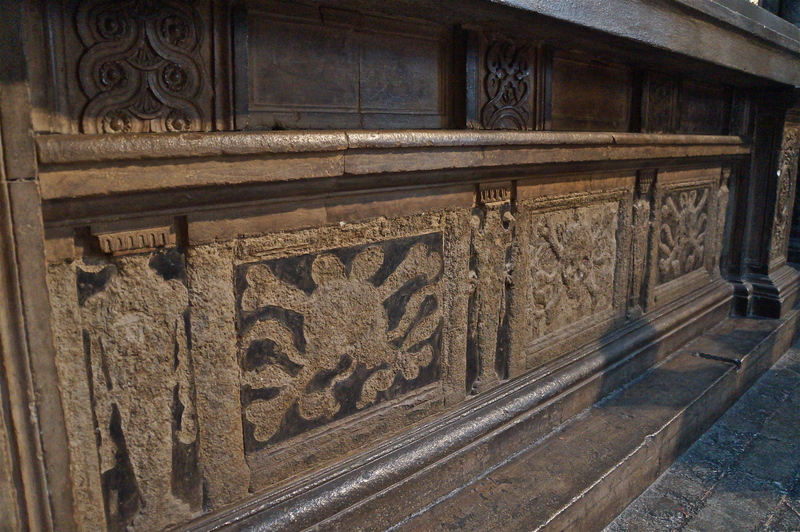 Christine uncovered the fact that the three different designs on the panels were identical to those oval cartouches carved into Anne of Cleve’s tomb in Westminster Abbey (see above). As far as we know, this connection had been lost to living memory, and for the first time we were able to sweep conjecture aside. There was now no doubt that these carved panels were directly related to England’s queen. It was a significant breakthrough, but by this time, I knew one thing for sure – we were way out of our depth! With this in mind, I contacted Jonathan Foyle, experienced architectural historian and ex-curator of Hampton Court Palace. I needed to know the origins of the carvings; were they contemporary or copies? Jonathan’s interest was piqued. A carved interior with unqualified provenance was definitely his kind of problem. The team, which now included Helen Hughes, a specialist in the forensics of early historic decoration, arrived at the church on one rainy, March morning in 2015. We were nervously expectant as Helen donned her magnifying glasses in order to identify, and scrape away, tiny deposits of ‘grunge’ from the panels. We hoped that these samples would contain microscopic flecks of paint consistent with pigments used in the sixteenth century. At the same time, Jonathan pored over the visual evidence. Disappointingly, initial results indicated that The Anne of Cleves Panels looked to be later copies; the wood was too fresh and there was no sign of the paint pigments that would have indicated a sixteenth century origin. For a time, our quest seemed to be at an end, and we reluctantly concluded that they must have been revivalist copies, made for an eccentric English gentleman, who had more than a passing interest in Tudor history. Then, no more than eight weeks later, a second synchronicity occurred – and it changed everything as it caused us fundamentally to question our original findings. A separate, single panel came up for auction at Bonhams in May 2015. The panel was identical to one of the designs in St Leonard’s Church; an oval cartouche containing the AC monogram, surmounted by a coronet. It was an unbelievable co-incidence! The Bonham’s Panel; notice the ‘gesso’ or plaster over the bottom third. The appearance of the panel opened up new vistas of possibility. Part of the panel was covered in ‘gesso’, a kind of plaster. The material matched the only material which Helen Hughes had managed to extract in tiny amounts from the panels in the church. Jonathan surmised that at some point probably all the panels had been covered in this material. This had the effect of preserving the wood beneath, and accounted for why the panels in the church looked fresher than might have been expected given their considerable age. It also suggested that originally, they had probably come from the same set. Everything now pointed to The Anne of Cleves’ Panels being directly associated with the lady herself, and that they were of sixteenth century origin. What we needed now was dating evidence. If the wood was of the correct age, we would be able to say definitely that the panels were contemporary to Anne’s life, and this would make them of great historical importance. Initally, we were not able to sample the wood from the panels in the church. However, we were lucky enough to get permission to subject the auctioned panel to the test. The question was, would it confirm our notion that these were real – or would we all be crushed for a second time; would they indeed turn out to be fakes? The Mystery of Panels is Solved! The Anne of Cleves’ Panels were likely created from a tree felled in the West German / Netherlandish region between the years 1538-1548. The most likely date of the panel’s creation was around 1544. Oh joy! The Anne of Cleves' panel was created from a tree felled in the West German / Netherlandish region between 1538-1548. The most likely date of the panel's creation was around 1544. This would be exactly around the time that we would expect for these panels to be directly associated with Anne of Cleves. By this time, Anne was divorced from the king and living as a wealthy ‘femme sole’, dependant upon no man. She occupied a series of grand houses thereafter; (in order, these being) Richmond Palace (shown left below), the Manors of Bletchingley and Dartford (shown right below), and finally, in the last months of her life, the King’s Manor at Chelsea. We can safely surmise that Anne commissioned these highly personalised panels at some point during this period. They reflected her ancestry and were to be carved from wood that had come from the area around, or near to, her Cleveish origins. We know Anne became increasingly home sick in her later years and longed to return home. How poignant then that she should surround herself with such symbolism, carved literally from the land of her childhood! The launching of the Bonham’s Panel at Hever Castle; now on permanent display. So, we come to the end of our adventure in time. We now have established beyond doubt that The Anne of Cleves Panels are part of a nationally important historic collection, illustrating the likely interior of the personal environment of a Tudor queen. These panels, and what they illustrate, are rare survivors, as very little of the domestic interiors of the Tudor royal family survive. You can visit the panels at St Leonard’s Church during daylight hours, although it might be best to the church warden in advance to ensure you will have access. Alternatively, you can view the Bonhams’ panel, which is on permanent display at Hever Castle in Kent. I encourage you to pack your travel bag and hit the road. Give yourself a treat; go gaze upon something that Anne of Cleves herself once knew with great intimacy and likely affection. P.S. READY TO PLAN YOUR NEXT TUDOR ADVENTURE? Then look no further! Subscribe to the blog and you will receive a download link to receive your FREE mini travel guide, A Tudor Weekend Away…in Kent, as a ‘thank you’ for joining The Tudor Travel Guide community. This mini guide contains a weekend itinerary in Kent, the so-called ‘Garden of England’, packed with information for the Tudor enthusiast on three properties all linked to the Boleyn family; Pashley Manor, Hever Castle and Penshurst Place; an historic walk that links Hever with Penshurst, and two accommodation recommendations; one luxury, one luxury for less. Click on the image below to subscribe now to get inspired for your next Tudor road trip! If you want to read more detail about this story of ‘rediscovery’, then you will find it documented in In the Footsteps of the Six Wives of Henry VIII. Thanks Annina, I really fell for Anne while researching her. So glad you enjoyed the post. Thanks, it was incredible fun and very thrilling. Excellent follow up on your thoughts /ideas in solving this detective work . Well done . Thank you. It was fun – very exciting. What a fascinating read! Now I want to read the book! Thank you for reading and I hope you enjoy it. Amazingly exciting, I loved being taken on the journey with you! The twists and turns I’m so glad they were proven to be genuine. Thank you! Stayed tuned for the mini documentary we are putting together – tone filmed next month. Absolutely Brilliant! It reads like an Agatha Christie mystery. Anne is my favorite of Henry’s wives..a clever woman who played her cards right! I am glad your a fan. I really came to appreciate her when I wrote about her for ‘In the Footsteps of the Six Wives of Henry VIII’. A good woman! ← The Life of Anne Boleyn – When the Ordinary Feels Extraordinary!